The Artist Quarter of Tzfat is today, in many ways, a "mixed city". It is populated by large religious families who live peacefully with Tzfat's artists and non-religious residents. There is, however, a strong atmosphere of a religious community. This, however, was not the way it was in the past. Artists began to gravitate to Tzfat before the 1948 War of Independence, and after the war, Tzfat became an artists' center of Israel. 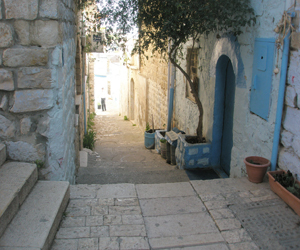 Many of Israel's best known artists bought property in Tzfat, and the quarter next to the Old Jewish Quarter became the Artists Quarter. The atmosphere was bohemian and secular. The coffee houses and restaurants of the main street stayed open till the wee hours of the morning, and pubs and bars flourished. During those years, the majority of the tourism to Tzfat centered around the art galleries, not, as today, the religious and historical sites of the city. Michael and Angie Alkov arrived in Tzfat in the early '70s and in 1980, bought a dilapidated run-down house in the Artists Quarter, next to the well-known artist Amitai. At that time, there was only one other family living on their street. Everyone else was an artist, some of them quite famous. Michael, an architect, began to slowly renovate the existing rooms which date back 150 years while building other rooms. Slowly the structure became a home for his family. One of the rooms that he built is constructed with wood, unusual in the area. The room sits on top of the roof, and is open on all sides with windows facing in all directions. This room was, for several years, a popular coffee house of the artists quarter, with Angie serving locals, tourists and the well-known artists on Saturday nights throughout the summer months. Old-timers still speak of eating at Angie's as a high point of their summers. As the family grew, they began to migrate from Tzfat, but today, Michael and Angie's eldest daughter, Sarai, has returned to run Michael's House, a 3-unit guest room. Each room is unique - the wooden rooftop "Tree House" is ideal for a couple ("I've had a number of honeymooners come to stay here" Sarai says "and that room is perfect for them"), while the other two rooms, with yards and lofts, are easy for families - one with 4 beds and one with 7. Each unit has a kitchenette with Shabbat amenities, shower/toilet, coffee corner, cable TV and central air conditioning/heating. The house is located within a 5-minute walk of the Old Jewish Quarter, and, in the other direction, a 5-minute walk from the main commercial section of town. The units are detached from each other, yet close enough so that families find it comfortable to rent a few units at the same time and vacation together.